What a weekend we had! Gracious me, I don't really know how we squeezed all that we did into such a short amount of time! This weekend was the Gadsden Service Guild's annual rummage sale. 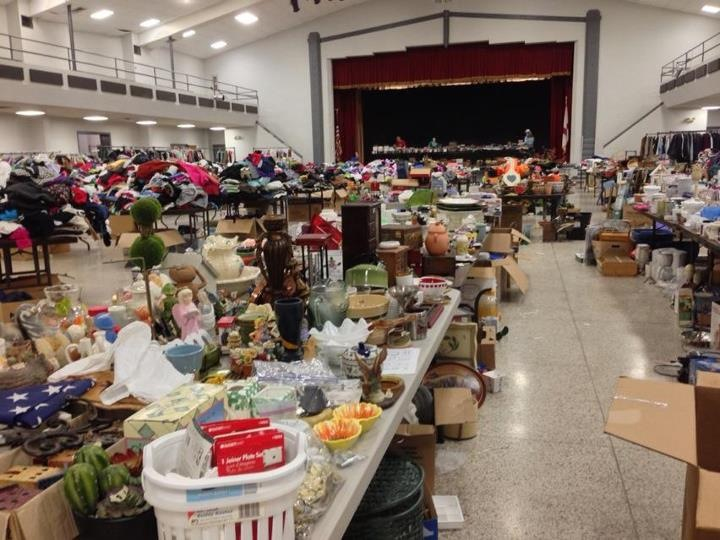 If you have never been to the sale before, it is HUGE! It is the main way that we make money to donate to our special charities so we put all of our efforts into it. We started unloading our 2 HUGE (like RV size) storage units on Thursday and unpacking everything at Convention Hall on Thursday at 3pm. By Friday at 10pm, we were finished and ready for the sale! I worked the entire sale--5:45am to 2:30! It made for a long day but it was really fun! I worked with Shalon in the "Formal Store", a specialty section with new or gently used formals. It was so much fun to help girls try things on, accessorize, etc. I felt like I worked in a bridal salon!! When it was all said and done, we raised nearly $20,000!! Great job girls!!! I left straight from the rummage sale and went to the LeBlanc's to help celebrate Eloise's 1st birthday! I can't believe their sweet baby girl is already 1!! She had an adorable Minnie Mouse party complete with pink EVERYTHING!! I really enjoyed seeing her open her presents, especially when she got Biddy Baby. I think I had more fun than she did!! Doing her pageant wave to her favorite friend, Mr. Forrest! Biddy Baby! She was so sweet to her! I left straight from the party and went to church. I was my only quiet time in the day!! Afterwards I ran home, change, made some dip, and headed to the Monk's to watch the Bama v. LSU game with our Young Marrieds group. We just so happen to all be Alabama fans so it works out perfectly! We all brought appetizers and snacked while we watched the game on the patio. It was a perfect fall night to bundle up and watch some football outside! We took a little break at half time to ride Ben's go-cart like we were little kids, and I may or may not have jumped on the trampoline. Alabama looked pretty terrible and was losing with 2 and a half minutes left. I had mentally checked out and decided we had lost. Well, LSU missed a field goal and Alabama was able to drive the field in under a minute and score!! I was so nervous I was huddled in a ball in a chair not watching the game. It was just too much!! It was an amazing victory even though we didn't look that great. I hope we NEVER have a game like that again!! I thought Ezra was adorable kicking back in this chair during the game. I didn't realize I was taking this while a Bud Light commercial was on behind him. Ooops. Forrest and I returned home victorious and ready for a LONG night sleep!! I literally did nothing on Sunday except sleep and watch tv. Forrest was much better than me and energized by the extra "fall back" hour of sleep, got tons of yard work done while I lounged slouthily on the couch with Ruffles. I have to mention that my cousin Ashley got engaged this weekend to her boyfriend Jeremiah! I LOVE Jeremiah and am so excited that he will be part of our family! He proposed to Ashley at the church we all attended in Tuscaloosa (where they met) with a beautiful ring! We had to miss her surprise engagement party due to our hectic Saturday but we couldn't be more thrilled about the upcoming wedding!! I hope you all VOTED today and remember what an honor and privilege it is to live in a country that puts the choices in your hands!! USA!! !